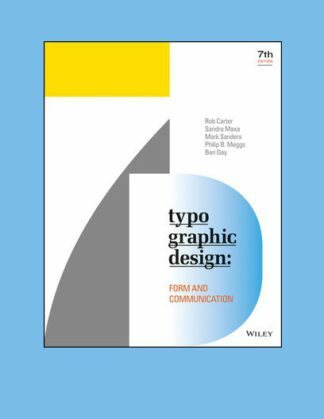 Typographic Design: Form & Communication is the definitive reference for graphic designers, providing a comprehensive introduction to the visual word. Done well, typopgraphy can communicate so much more than the words themselves. Typographic design determines how you feel about a message, the associations you make, and ultimately, the overall success of the communication. Typographic design extends from the page to the screen, and is a critical element of almost any graphic design project. This book provides essential guidance on everything related to type: from letterforms and negative space, to messaging, processes, and history, aspiring designers will find great utility in mastering these critical concepts. This new seventh edition has been fully updated with new coverage of contemporary typography processes, updated case studies, and new examples from branding, print, web, motion, and more. On-screen typographic design concepts are discussed in greater detail, and the online supplemental materials include new flashcards, terminology and quizzes.